This system was designed with the challenges of venting cabinetry in mind. It is ideal for fine cabinetry that you do not wish to cut holes in, built-in cabinetry with limited options for venting, or when cabinets have multiple ‘bays’ and components are in the center areas. This is the first product to defy heat naturally rising as it pulls hot air into the duct and then down and out the toe kick of the cabinet. <?xml:namespace prefix = w />Not only is it perfect for these applications, it is also easily installed and fully configurable to work perfectly in a variety of systems and configurations. The body of the unit is made out of attractive yet durable PVC tubing and the fan units are easily cut into the body at the ideal locations for the application. This way, there is no need to worry with the placement of the components as a fan unit can be installed behind each piece of heat producing equipment. The side of the body can also be fitted with wiring clips to keep the wiring neat and organized. Additional tubing can also be added and additional fan units are available as well. 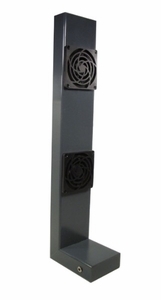 As with all of our products, the fans in the Cabinet Duct System are variable speed and by adding a Temperature Controller, you can add automatic control including basic on/off as well as automated variable speed control so as the heat rises, the fans accelerate. The system is fully compatible with all of our temperature controllers and the controllers simply plug inline between the power supplies and power jack on the system.